P.C.M. mechanical screw jacks series “S”, could be used in the following fields : lifting, travelling, handling and any type of linear traverse requiring high thrust capacity. 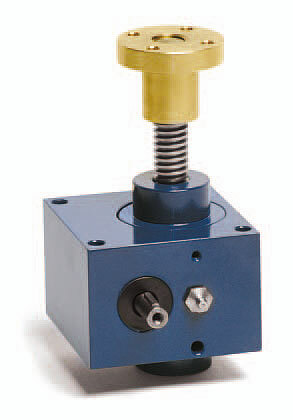 Rotating spindle screw jack with brass lead nut. Rotation of the worm, carried out by the threaded spindle. on it is found a lead nut, for contrast, generates an axial push. Thanks to their manufacturing simpleness, make them highly resistant and suitable to be used also under heavy conditions, besides lubrication by means long-lasting lubricant reduce the maintenance. You will find in the following pages the important features in order to enable you to find the correct screw jack dimensions for the different fields of application.